That’s what everyone wanted to know about the notorious 18½-minute gap in Richard Nixon’s Watergate tape, for which Rosemary Woods eventually took the fall. Now it appears that something similar happened with the Vatican’s tape of the interfaith prayers-for-peace from last Sunday, giving us even more reason to dub this controversy “Imamgate”. As we reported in last night’s post about the imam’s prayer at the Vatican, there seems to be nothing controversial in the chanted Arabic in the prayer and that spoken in his subsequent remarks. However, a reader and commenter named ritamalik — who is a former Muslim and understands Arabic — tells us that a portion of the video has been edited out, and the omitted section included the verse asking Allah to grant victory over the infidels. You were accurate! Don’t blame yourself! These bastards have cut out the controversial last half-verse from imam’s recitation in the clip. What they have done here is pure and simple censorship, deception and rewriting of history. Pay attention to the clip. They cut his recitation in the middle of the last verse! I do understand Quranic Arabic very well. I also know Quran itself rather well. I am an ex-Muslim. This link that you have posted was cut! The full recitation from the Quran by this imam that I watched on the Al Arabiya channel two days ago had his recitation up until the final verses, and without a shadow of a doubt he recited the second sura Al Bagharah’s last few verses till the very end where he did say, “and pardon us and forgive us and have mercy on us, you are our guardian, so make us victorious over the tribe of disbelievers [or ‘deniers’, as the word kafir really means]”. Now the question is: who chopped this video to take out the controversial part out of it? It is cut literally in the middle of the verse where the controversial part starts, and jumps to the imam’s prayer in his own words, which are not controversial. You can recognize the end of recitation and beginning of his own prayer by the fact that he stopped singing and start speaking normally. If you pay attention you will notice the place where it was cut. It is noticeable. They kept his recitation until the end of the of “forgive us and have mercy on us.” But the last two clauses — “you are our guardian, so grant us victory over unbelievers” was neatly and in very Stalinesque fashion airbrushed out! Cunning bastards! That is why your Russian translator didn’t hear anything controversial. But he can go check his Quran and see that up till the last two clauses which are missing, everything before it is the final verses of sura 2. Now you want to tell me he just left out the last half verse from his recitation?! Of course not! Who recites Quran while reciting a verse only half way through?! They are counting on people’s ignorance of Arabic and Quranic content. They want to throw us off track and confuse us. Your original report was 100% correct! You have nothing to correct. Only now you can also report that these bastards have censored the original footage to save themselves from the embarrassment of being mocked and outwitted by an imam. That’s all! Don’t fall for it. And the fact that they had to censor the original footage shows that despite their original denials they recognized the damage and the legitimacy of those reports which pointed it out! The big question is: Who edited the tape? It had to have been done by someone in the Vatican, or by someone employed by the Vatican. So the Imamgate scandal has just become even more scandalous. 1. The Pope invited an imam to the Vatican to say prayers at an interfaith event. 2. Departing from a pre-released script, the imam prayed in Arabic for Allah to grant victory over the unbelievers. 3. The Vatican denied that the imam said anything of that nature. 4. The Vatican altered a video of the event to remove any evidence of the damning clause. So what comes next? What will #5 be? Stay tuned. Also: if anyone can find an uncut version of the Arabic part of the video, please send us the URL. 12 What Did the Imam Really Say at the Vatican? This entry was posted in Counterjihad, Europe, Middle East, News, PC/MC, Religion by Baron Bodissey. Bookmark the permalink. Another example of taqiyya, this time performed by the Vatican on behalf of its Muslim friends…perhaps the Pope is concerned that his Swiss Guards aren’t up to the job of protecting Vatican City? It’s not the Swiss Guards that aren’t up to the task of protecting Vatican City – but – The Pope whose task is to preserve and protect his flock of faithful ‘believers’. Begs the question, if Catholics believe the edited video, what other deceptions is this Pope hawking? The Pope whose task is to preserve and protect his flock of faithful ‘suckers’. oh, right. You just explained *your* motive. I know lots of intelligent Catholics who are not suckers at all. Please don’t globalize..but thanks for explaining. Saves me having to go over to that wiki link you provided. Look up what “Beg the question means.” You don’t know. Having seen their uniforms & routine, they’re so camp I d be concerned. Maybe there is a case against gays in the military! The West — governments and news media and academics — has been doing proto-dhimmitudinous taqiyya for years in various ways. Meanwhile our side is, through PC MC motives, anxiously enabling our own enemy’s propaganda. So this does not include the verse? Bless the brave souls who can listen to his whining and even focus enough to translate it, I find it unbearable. No. unfortunately this Youtube clip that you have posted is also censored. But I have already found and posted one which is not censored. Every single sermon by muhammad, invader, any Imam since 622 A.D. When Constantinople fell to Ottoman Sultan Mehmed II, he thanked Allah for granting him victory and returning Allah’s land to the believers. Then he looked west considering all of Europe. Looting, wars, blood, taking river and cities, countries and continents are the dynamics that for a momentum for Islam to advance. They say: “Allah gave us petroleum to make infidels roll at our feet. And the sour sermon at the Vatican should not be an exception. The imam can’t adjust his sermon to appease the dunces. Why should he: he offends them deliberately. They can’t hear, They can’t see evil. They will do anything, remove anything, omit anything, add anything to appear benevolent, ungullible. If they were clever to refuse the “interfaith meeting”, the first to condemn the Vatican would have been the ungodly, undirectional, muslim-fascinated Europeans, especially the Nordic Humanists, who are known for being subservient to muslims to avoid conflicts. Just why there are no persons with balls, brains and logic, and will in Europe is puzzling: Only 2 or 3 in Britain, and in Austria, and France, . . . The Vatican , by lying, they are behaving exactly as the rest of the west is behaving towards muslims over the last 60 years. They dare not take a stand or unpleasant decision against muslim whims for fear of triggering a war. But that war is coming anyway. Making it inevitable by the abject, debased low way the west is behaving towards the imported, beloved, romantically loved invaders. Invaders that have done nothing over the last 1400 years but invade the lands of the dunce. Murad’s post is enlightening. I could not believe the Pope allowed this and now we see what skulduggery was afoot. I am waiting for #5. How depressing it all is. This Pope is an ANTI-POPE. He’s inviting bloody rabid islamists into the vatican. His mind is absolutely and completly clouded with political correctness, just like your typical leftie journalist, he’ll NEVER and I mean NEVER recognize the threat which lies within islam. All of the popes before the second vatican council were not afraid to say that islam is a false religion , that it is of the devil and that by professing it you’re condemning yourself to hell. After the council, something strange has started to occur. I believe that the catholic church has been completly infiltrated by leftists and people DEDICATED to destroy this church and this religion.Franis is the last straw. If anyone still stays by the side of this man, well… Suit yourself. And Allahu Snackbar. John Paul II was not much better: it was he who not only kissed a Koran, but who also facilitated the construction of the largest mosque in Europe, located in Rome but a stoning-throw away from the Vatican. This expose sheds a whole new lights on what is really going down within the Vatican. Many questions now need to be asked by those concerned enough about losing their Church to a bunch of scheming infidels and closet Communists. Mmmm. The pope was just turning the other cheek. I haven’t looked at this wiki, but do you know who wrote it and what their motive was? Are they upfront about it? Does your wiki recall the priests tortured by Mengele in Auschwitz? Or the martyr, St Maximilian Kolbe, who gave his life that the father of a child might live? Or the 800,000 plus Jews that Ven. Pius XII saved by a) throwing open the doors of the Vatican, Castel Gandolfo, monasteries, churches and convents to shelter them and b) authorizing priests to fabricate baptism certificates that they might travel safely? Or the contemporary accounts of the good that he did and the praise from Golda Meir? We appear to have two “Peters” commenting on this webite. I did not make the contribution above. Any suggestions how we resolve this? Yes. Change your displayed name to something else, e.g. “Peter in Thailand” or something similar. Thank you Murad for your comments and Dymphna and Baron for this post. We westerners are so ill prepared to handle what the Islamists are hurling at us. So many lies from so many quarters to wade through. Deception IS warfare. 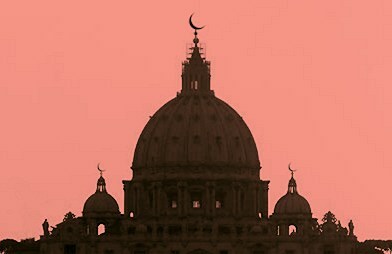 As soon as I heard that the Vatican would have Islamic prayer, I knew in my heart that it would not turn out well. Islam senses our weaknesses as exposed in our flagrant dhimmitude in response to their pushing and probing. And, of course, our collective ignorance of language and culture has certainly been helpful. As a result, their aggressiveness is emboldened and they find new ways of expression. I know that my dog likes to mark our property lines every day. I tend to feel the same way about Islam whenever it mixes with us in the West. It is no wonder that Al-Baghdadhi feels the time is right to make himself into a long desired Caliph. Islam has now touched nearly every symbol of the West from the White House to the Vatican enclave. Much of it without firing a single shot. We simply gave in and walked the dog. Going to the heart of the Beast in Rome and calling for their god to grant them victory over the Pope’ god is brazen “war by other means”. It also helps to expose all the useful idiots who do not understand the severe state of war that Islam poses to the west and to the US in particular. The Three Demands are real: you many not be interested in Islam, but Islam is interested in you, infidel! Convert, submit or die resisting. Around 2003 or 2004, I was visiting my father and noticed a book on his desk purporting to rectify “misconceptions” that people might have about Islam. It was written by a Lutheran scholar, supposedly well versed in theology and religious history. I was pretty sure it was being specially promoted by the pastor at my father’s church. Of course, the book offered a highly sanitized view of Islam: just the nice, “spiritual” elements, without the hateful core or the long history of violent aggression. A large portion of the clergy in the mainline churches today are inclined to see “tolerance” as the highest of virtues. If they overlook the bad in Islam and focus on the nice parts, they can congratulate themselves for their Christlike love — because Christ loved everyone, even the worst sinners, didn’t he? On a personal level, it can be admirable and socially beneficial to seek the good in people and focus on that. But turning a blind eye to real threats to oneself or others is another matter. On an institutional level, most of our “leaders” seem intent on maintaining a more-tolerant-than-thou posture, and unconcerned about real threats to those for whom they bear the most responsibility. Yes, in the absence of a full video of the meeting (which might not exist), all this is simply imagination, with a dose of ignorance. Even Murad, whose position I respect, just assumes that the Vatican is “lying” without offering any proof. There is no problem with the sound. I checked it again. I tried it again — still can’t hear anything. I can hear the cleric’s first word — then the rest is silent. I tested other YouTubes to make sure it wasn’t my computer’s problem. I can hear other YouTubes just fine. I have no problems with the sound Hesperado. Your computer is playing tricks on you. I suggest hanging it over the balcony and threaten it to stop messing around.I learned that from a gangstermovie. Really? And why were ritamalik’s comments ‘adapted’? Were his words changed? The grammar smoothed out? Or was there more to it? We’ll never know, will we? This is the pot calling the kettle black. Ritamalik criticizes supposed audio legerdemain, but what we read is self-admittedly adapted – hardly a firm endorsement. Be careful of apostates of any stripe. When someone renounces a lifetime of belief their subsequent highly emotional commentary often has as its agenda to strike back at the oppressor. That may or may not be the case here – the point is that we must be aware and decide for ourselves. My good sir: I left BOTH of ritamalik’s original comments, untouched, on the earlier post, and provided the link, so that you can see the original totally unedited texts. I adapted the comments because some of the material overlapped, and there were duplications. I also corrected spelling errors and straightened out syntactical irregularities, as I do in all my editing. I suggest that in future you avoid bruising yourself any further by jumping to conclusions. I am really happy that the editors of this page edited my many grammatical and spelling mistakes while posting my comment on their front page. It saved me from a lot of embarrassment. English is not my first language so I tend to make mistakes. But my comments were very faithfully represented and nothing important was missing. So please calm down! By the way telling that I am not to be trusted because I am an ex-muslim is really nothing but ad hominem attack! I said check the dictionary and see if the word نصر which is the word in question means victory or not. You can check that on your own. I also said that the video clip on their page was censored and I was right since now I have found and posted the link to the video of the same event uncensored in my comment above and you can see that I told the truth. The last part of Imam’s recitation was missing from the first clip but not from the second which I posted. I did not make anything up or try to “strike back at the oppressor” or anything like that! I happen to know a decent level of Arabic and know Sura 2 and quite a lot of Quran actually so I could be of help. Now my muslim background helped me in this. Those who never have been muslim before usually don’t know the Quran that well even if they speak some Arabic. I was glad to be of help. I understand that you want to be sure and not be duped with someone who might want to exaggerate or have some ignoble agenda. But as I said you can check my links above and also look up in an Arabic dictionary to check and see if I was right. If you check them and find me wanting or misleading then by all means warn people about me. But if you don’t have the time, skills, or interest to check what I have said I would appreciate it if you also refrain from spreading unfounded doubts about my motives and character. Thank you! No one who didn’t *have to* learn the Koran would. Just as many folks in this post-Christian age would never take up a Bible to read it. Thank you for the information you provided. I am sure you know we appreciated it, despite the opposition. Just means you struck a nerve…the Nitpick Nerve. Since one of the tenets of Islam is that it’s just fine to lie to non-Muslims, suspicion seems reasonable; note also that I’m suspicious of those who denounce Ven. Pope Pius XII as I’m aware of his heroic virtues. Note also that one of the Pope’s advisors is an arabic speaker who’s familiar with Islam. Is it a waqf now? Set it as a rap, Hesperado; although as it seems neither misogynistic nor violent, it may flop!